Want to Save $ on your Water Bill This Year? My spouse calls me the’ Water Nazi’. Everyone has something they tend to be passionate about (ok, compulsive), and wasted water is mine. 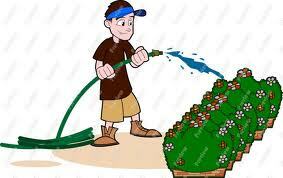 Every gardener knows that effective watering the first year after planting is essential to the success of their plants. After all the grumbling I heard from customers last year about water bills, I thought it timely to offer some of my favorite watering tips. The most important thing to remember is to slow the water down. The slower it moves, the more of it gets absorbed where you want it. The most obvious way, is to slow the water flow to a trickle or slow stream. Let it run for a spell while you pull weeds, or set a timer and do something else. My favorite watering tip is to use a five gallon bucket with nail holes in the bottom of the side. Place it next to the base of the plant and leave. Restaurants are a good resource for free ones. For big plants, use three at once. Just imagine, the number of plants you can water in an hour is limited only by how many buckets you’re able to collect! Create contours around plants and in the soil surface. Resist the urge to smooth the soil once you’ve planted a flower bed. Before you spread mulch, make the soil surface choppy, like Lake Erie on a windy day. The water will pool in the craters, and the mulch will conceal them. This is especially helpful for watering a slope. Keep a five gallon bucket with a handle beside the kitchen sink to catch rinse water, and use it to water houseplants and plants under eves. We empty ours two to five times a day, sometimes more! I found a better way to use an oscillating sprinkler. When used as intended, especially when it’s hot, too much water is evaporated before it hits the soil. 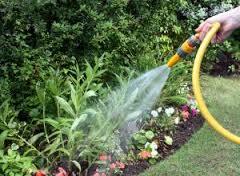 Try holding it like a watering wand to water sod, a seeded area, or a long narrow bed. I recommend using soaker hoses with caution because the amount of water delivered depends on your water pressure, and the distance from the hydrant. More water is released at the beginning of the hose than at the end, so it is wise to investigate with a trowel to see if you are getting a thorough soaking. 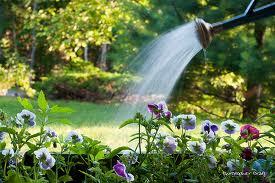 Please call Oakland for questions about watering your new plants all summer long.